We provide up to $24k in Down Payment Assistance! How would you spend $24,000? You could buy 1,589 pizzas. Or you could see 2,439 movies. Our favorite way? On a down payment, of course! Home At Last™ provides “customized” assistance options to help more Nevadans become homeowners. The down payment assistance is provided in the form of a 3-year second mortgage that is completely forgiven after living in the home as a primary residence for the first three years. There is NO interest and there are NO payments on the down payment assistance provided. A Home At Last™ lender will pair the assistance with a 30-year first mortgage with a fixed interest rate. And, there are NO separate applications to fill out, so it’s easy and doesn’t slow down closing! Home At Last™ approved lenders pre-qualify homebuyers for the mortgage loan required to purchase the home. 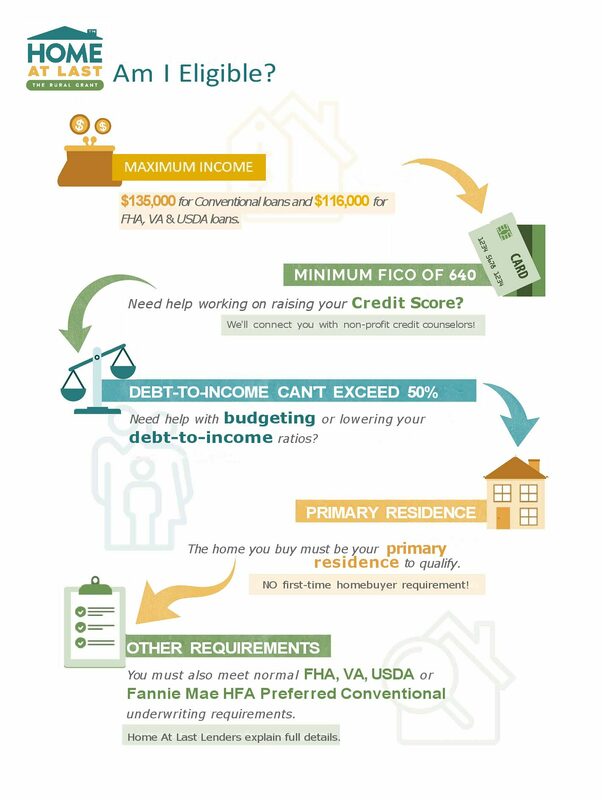 Loan types include FHA, VA, USDA Rural Development, and exclusive Conventional loans known as HFA Preferred and HFA Advantaged that are available only through a Housing Finance Agency like Nevada Rural Housing Authority. There are NO purchase price limits when buying a home through the Home At Last™ program, although the loan type may impose a limit. Of course, all loans must meet applicable loan guidelines, but the Home At Last™ lender will explain those details. Home At Last™ down payment assistance – it’s the real deal, helping to get Nevadans home every day! I’m Ready to Take the Homebuyer Education Course! ¡Estoy listo para tomar el curso Educación para Compradores de Vivienda! I’m a homeowner, where do I find the “After the Close” Homeowner Education course? I used Home At Last™ and want to share my story! Where can I get credit counseling or help creating a budget?